All the features you need at the cost you want! Test drive this Malibu and be entered to win this months Test Drive & WIN draw! ONLY at Laird Wheaton GM in Nanaimo.IIHS Top Safety Pick with optional front crash prevention. This Chevrolet Malibu Limited delivers a Gas I4 2.5L/150 engine powering this Automatic transmission. Wipers, front intermittent with structureless wiper blades, Windows, power with express-down on all, Window trim, bright, side. *This Chevrolet Malibu Limited Features the Following Options *Wheels, 16 (40.6 cm) aluminum, Wheel, spare, not desired, Voice recognition for phone, music and radio, Visors, driver and front passenger illuminated vanity mirrors, Trunk release, power located in CHMSL decklid, push button open on key fob, Trim, seat, Premium Cloth, Transmission, 6-speed automatic, electronically-controlled with overdrive, Tires, P215/60R16 all-season, blackwall, Tire, spare, not desired, Tire sealant and inflator kit. *This Chevrolet Malibu Limited is a Superstar! *IIHS Top Safety Pick with optional front crash prevention, IIHS Top Safety Pick. 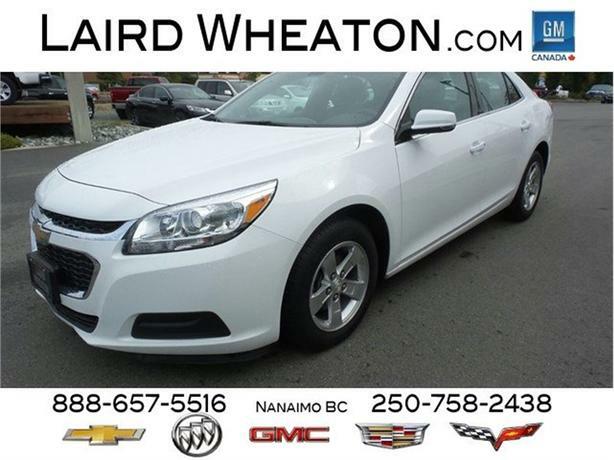 *Visit Us Today *Come in for a quick visit at Laird Wheaton, 2590 Bowen Road, Nanaimo, BC V9T 3L3 to claim your Chevrolet Malibu Limited!